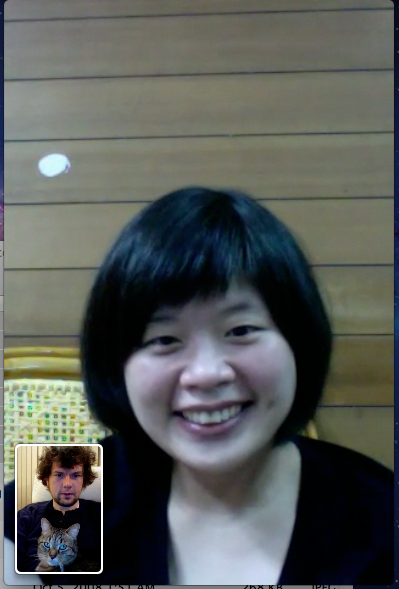 In the image to the left, Miao and I are talking with Y with Apple’s Facetime technology. Y is visiting her family in Taiwan, so we are relying on Apple’s Facetime on Mac OS X 10.7 Lion and iOS 5 to talk face-to-face. Facetime is integrated into the new device and computer operating systems so that you can “call” someone with Facetime and your iPad 2 or iPhone 4S will “ring” automagically with an incoming connection request. We have also used our MacBooks to handle Facetime conversations. The quality of the video feed is largely dependent on Internet transfer conditions between Ohio and Taiwan. The video is sometimes fluid and sometimes strobe-effect like with lots of funny faces captured by our devices’ cameras. When it works well, Facetime is very slick, but it even holds up well for visual communication over long distance even when conditions create video freezes. The audio generally comes through clear and without stutter–I suppose it is prioritized over video. Since audio seems prioritized, I would think that they are separate streams that have to be synced at the receiver’s end. Perhaps this is why Facetime spikes CPU usage–muxing the separate streams while simultaneously transmitting demuxed streams. Have you found an explanation Apple’s implementation of the technologies that make Facetime work? Let me know in the comments.